Google began rolling out Google Now to desktop versions of Chrome on Monday. 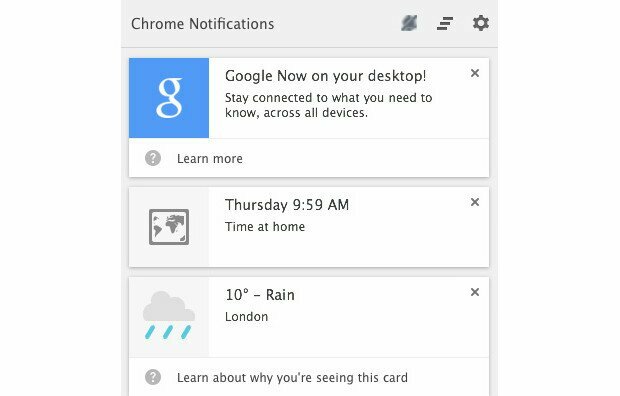 Users of Google Now’s Android and iOS apps can now see the intelligent personal assistant’s contextual notifications from their desktop when using Chrome. The notifications will come in the form of Google Now cards, and include weather updates, sports scores, traffic alerts and reminders for upcoming events. Google said some of the notifications that users see on their desktop will be determined by the location of their mobile device. Google Now on Chrome shows a subset of the Now cards you see on your mobile device, which uses your device’s location, Google explained in a blog post detailing the update. You’ll only see location-based Google Now cards on your desktop for devices that have Location Reporting turned on. Google has worked for more than a year to bring Google Now to Chrome for desktop. We first noticed hints in Chromium’s code back in December 2012, which was soon followed by its initial arrival in Chrome Canary in April 2013. The feature eventually became actually usable in January 2014. After it arrived in the beta channel in February 2014, it was just one step from being available to all Chrome users. Now it’s finally here.